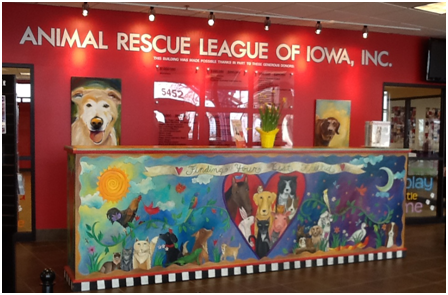 One of the goals of the AWF Board is to visit other Animal Shelters in Iowa. Our intention for the visits is to learn how to better proceed with the building of the AWF Animal Rescue Facility. We feel the other shelters that have been through the process can offer us a wealth of information on what works the best as far as the construction goes. Animal Rescue League in Des Moines Iowa AWF Board Members Kelly Day, Ruth Carlson, Annie Locher and her dog Jenni along with Vicki Kelchen, and Dave Boehm visited the beautiful Animal Rescue League in Des Moines Iowa on February 6, 2013. We were graciously greeted and guided by Tom Calvin and Mick McAuliffe who proudly toured us through their fantastic facilities that houses cats, dogs, and other large and small animals that await their ‘Forever Families’. 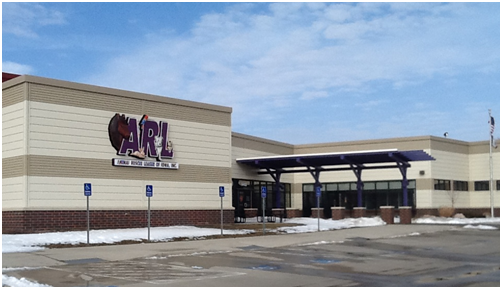 Animal Rescue League EntrywayWith a focus on adoption, humane education, cruelty intervention, spay and neuter programs, and reuniting lost and found pets with their owners, the ARL is the greater Des Moines area’s only shelter that never turns away an animal in need. Our hopes and dreams of what we wish our own shelter to be were confirmed. We felt energized to have seen such love and concern given by Tom, Mick and their staff for all the animals who are under their care. Dubuque Regional Humane Society in Dubuque Iowa AWF Board members Ruth Carlson and Linda Reicks took a road trip March 1, 2013 to visit The Dubuque Regional Humane Society of Dubuque Iowa (DRHS). They were greeted by Jane McCall, President and CEO. Jane shared with us their Mission; DRHS protects and promotes the well-being of all animals by fostering respect for their inherent dignity. Jane also shared their Vision; DRHS envisions a community where every pet has a permanent and loving home, companion animals are spayed or neutered and all animals are treated with respect and compassion. Both Shelter Directors and their Staff were very willing to share information about what made their facility the success it is today. We are very appreciative of the guidance and directions they gave us in what we may want to implement in the building of our shelter. We hope to partner with both these shelters one day when we have our shelter in place.